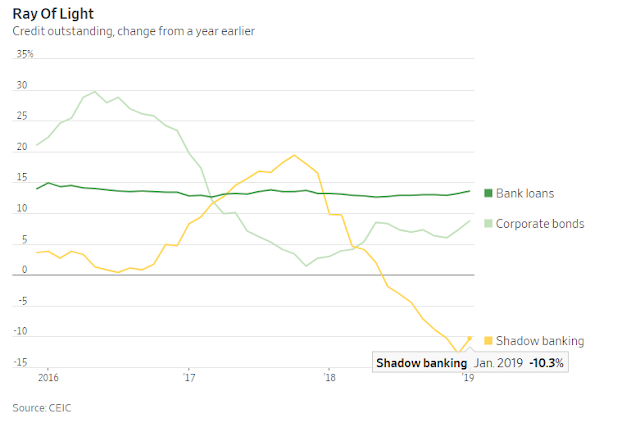 Are banks and shadow banks free to lend again? Don’t ask Beijing. 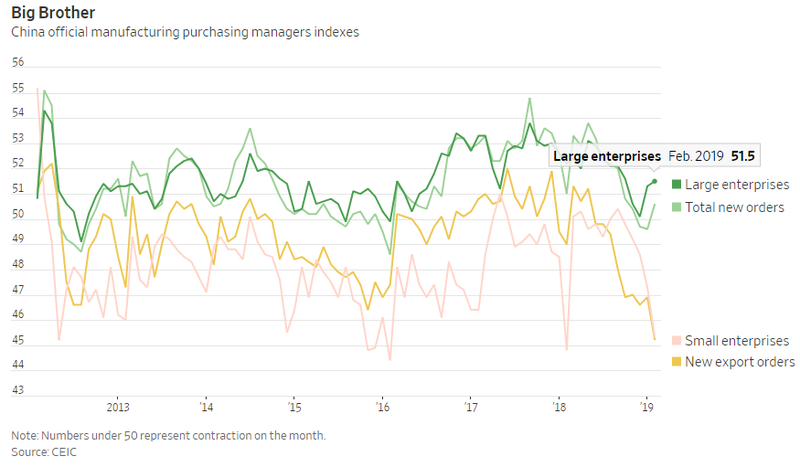 China’s gauge of factory activity for February released Thursday fell to its weakest since early 2016 at 49.2—the third straight month of contraction. That sounds worrying, but there are some economic green shoots appearing. Unfortunately Beijing’s leadership is divided on what to do next: meaning the possibility of a policy mistake derailing growth or markets is rising. First, the good news: new orders rebounded for the first time since May. Big, state-owned factories are starting to benefit from policy stimulus and infrastructure investment, which has been slowly recovering since late 2018. The purchasing managers index looked much uglier for small, export-exposed private firms who are critical to employment and income growth. But there have been some hopeful signs recently there too, particularly on funding. Chinese shadow banking, which cash-starved private companies depend on, rose by a cool 343 billion yuan ($51 billion) in January—the first rise since last February. Yields on AA- rated bonds, among the best real-time indicators of small business borrowing costs, have fallen about 0.5 percentage points since late December. Policy makers, still under pressure to take a hard line on financial risks, are deeply ambivalent about this easing of conditions. Short-term bill financing—often the only type of loans risk-averse state banks will grant small firms—was a big part of record lending numbers in January. Some in Beijing are unhappy that so much lending is short-term, because that’s helping drive new bubbles in stocks and high-rated bonds. The strong credit data prompted a rare public spat between Premier Li Keqiang and the central bank last week—the former arguing that the sharp rise in bill financing creates new potential risks, and the latter appearing to respond hours later through a question and answer in its official newspaper, saying such risks are minimal. With so many conflicting signals coming out of Beijing, local regulators and loan officers may conclude the safest route is to pull back and wait for more clarity. These green shoots are fragile. Too many gardeners stomping around Beijing isn’t helping.